The Canadian Association of Foot Care Nurses is an organization formed by practicing Foot Care Nurses from across Canada. At this time there is no certification process for nursing foot care in Canada that is recognized by provincial regulatory bodies. CAFCN is in the process of developing national competencies, educational opportunities, and a certification process for foot care nurses across Canada. CAFCN is not affiliated with, and does not endorse, any certification process currently being offered in Canada. The mission of the Canadian Association of Foot Care Nurses is to advance the practice of foot care through a collaborative and networking process for all individuals providing foot care. Work with us to improve the health and experience of our patients. T-shirts, travel mugs and jackets! 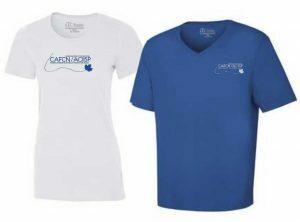 Order your CAFCN logo’d gear online and pick it up at the conference. The CAFCN National Competencies process started in 2015. Adapted from other client-centric frameworks from Canada and across the world, it lays out the path ahead for foot care nursing in Canada. Nursing foot care is a practice that always considers our patients and clients holistic’s needs. We realize that we must practice as part of the greater health care team. Our care often intersects and overlaps the care given by other health professionals. To help us do this we draw on resources from a wide variety of other sources as well as our own to help us be valuable team members. The CAFCN Nominating Committee is requesting applications from the membership for open positions. The Mission of the Canadian Association of Foot Care Nurses is to advance the practice of foot care through a collaborative and networking process for all individuals providing foot care.